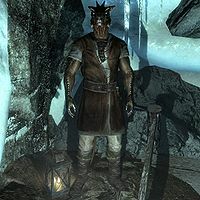 Teeba-Ei is an Argonian scout working as a miner at Rockwallow Mine in Stonehills. If the Stormcloaks take over Hjaalmarch, he will become the housecarl for his former employer, Sorli the Builder. Like the rest of the miners employed at Stonehills, Teeba-Ei sleeps in the small camp outside Rockwallow Mine every night between 1am and 6am. After waking up he heads directly into the mine and spends twelve hours mining iron, at times pausing to eat or relax. At 6pm he heads down to the camp and enjoys a two-hour dinner with his friend Jesper, before he heads back into the mine, working until his bedtime at 1am. One major exception to his daily routine occurs if the Stormcloaks take over Hjaalmarch as part of the civil war. His employer Sorli the Builder will then be appointed jarl and will move to Morthal. Teeba-Ei will become her housecarl and will stand by her side inside Highmoon Hall every day between 8am and 8pm. Once the court closes, he returns to Stonehills and works and sleeps as before. At 8am on the next morning he returns to Morthal and his new duties as housecarl. He wears a set of farm clothes with boots. He carries his pickaxe, an iron dagger, the key to the non-existent Longhouse, and a selection of common items and gold. Teeba-Ei is obviously not happy about the cold weather of Skyrim and will remark: "Stonehills' warmth is a welcome change in this cold, bleak land." He will also reveal: "Teeba-Ei the hatchling never imagined working a mine in this cold place. Greater things were dreamt of." and "This is not where Teeba-Ei was meant to live out the rest of his days." Even after he is appointed housecarl, unlike most new members of a Jarl's court, Teeba-Ei's dialogue doesn't change. This page was last modified on 19 January 2015, at 23:18.